Leave the car in Drive or Eco and in everyday driving the regenerative braking system itself is wholly unobtrusive. Where it not for the needle flicking about the power-use gauge, you'd assume the job was being done by conventional engine braking or a set of common-or-garden disc brakes. During the day we spent with the iMiEV, we managed to get exactly 48 miles from a full charge. Not too impressive, we grant you, but then we did drive it hard along the A419 from Cirencester to Stroud and back with complete disregard for economy. We suspect that if driven more considerately, around 80 miles - which is what Mitsubishi claims for the iMiEV's range - would be achievable. On open stretches of road, at a steady 60mph, the power gauge was always in the green zone suggesting that it's acceleration rather than speed that does for the battery pack. Once you have flattened the battery, you have two recharging options. 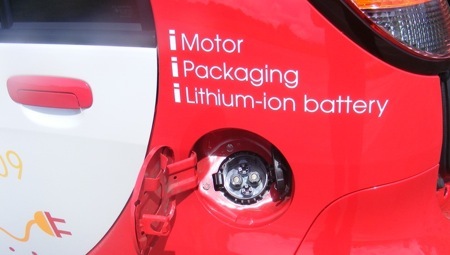 On the right-hand side of the car is a socket to connect the car to a domestic 240V power outlet that Mitsubishi reckons will charge the car fully in around six to seven hours. On the left-hand side is a quick charge socket. 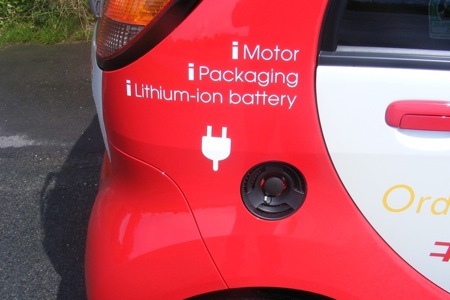 Apparently, when hooked up to an off-board three-phase 200V/50kW quick charger developed by the Tokyo Electric Power Company, the iMiEV's battery can be charged to 80 per cent its of capacity in about 20 minutes. Better, but it still doesn't match a regular fuel stop. Mitsubishi likes to point out that the iMiEV is a genuine five-door, four-seat family car, and so it is. Despite the car being only 3.4m long, 1.48m wide and 1.6m tall, the interior has more than enough leg and headroom for four 6ft adults to travel in comfort. Luggage space is more of an issue: the boot is very, very shallow, being almost flush with the bottom of the tailgate. This is an hangover from the iMiEV's i underpinnings, which houses its 660cc turbo-charged three-cylinder engine under the boot area. Assuming your carriage requirements are four adults or luggage rather than all at the same time, the rear seats can be folded forwards for increased boot space.